MOSCOW, October 21 (RIA Novosti) – The local residents of a small village in Russia’s Siberia some 200 kilometers away from the city of Krasnoyarsk were very much surprised to watch as thousands of ladybugs were stucking all over the local church. Within couple of hours the insects found shelter all over the walls, windows and outside icons of the St. Trinity Cathedral in the village of Shalobaevo. The people were furthermore surprised because outside temperature dropped to minus 15 degrees Celsius, which is considered freezing for any insects. And while the residents readily supposed that it might have been the hand of God, a zoologist of Russian Academy of Sciences told Rossiya Segodnya that the reason is quite simple. The ladybugs are now migrating to the places of their hibernation, but it has nothing to do with the cathedral. It just happened to be on their way. 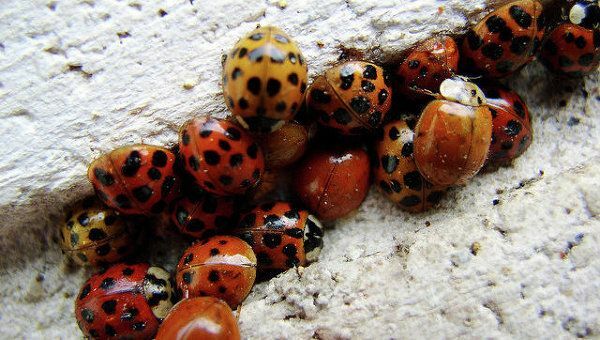 The zoologist added that this summer weather was very favorable for ladybugs breeding, especially in Russia’s Siberia and in the Far East. And the cold came very unexpectedly and many of the insects may die.